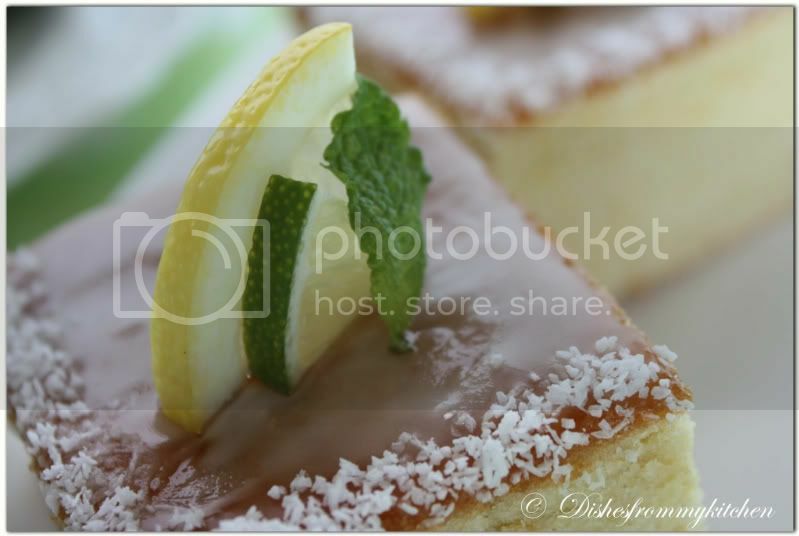 Dishesfrommykitchen: LEMON DRIZZLE CAKE - YUMMY !!! LEMON DRIZZLE CAKE - YUMMY !!! Hi all, hope everyone are doing fine. First of all I thank everyone who visited my space and enquired about my absence. Since longgggggg..... I mean few weeks I did not post anything because of house move and stuffs. I really missed everyone and just don't want to miss anymore. But still I need few weeks to settle down and visit your sweet posts. I had little time this morning so I wanted to post which was lying in my draft for so loooong. Coming to the recipe part, This is wonderful buttery cake with zesty touch in it. 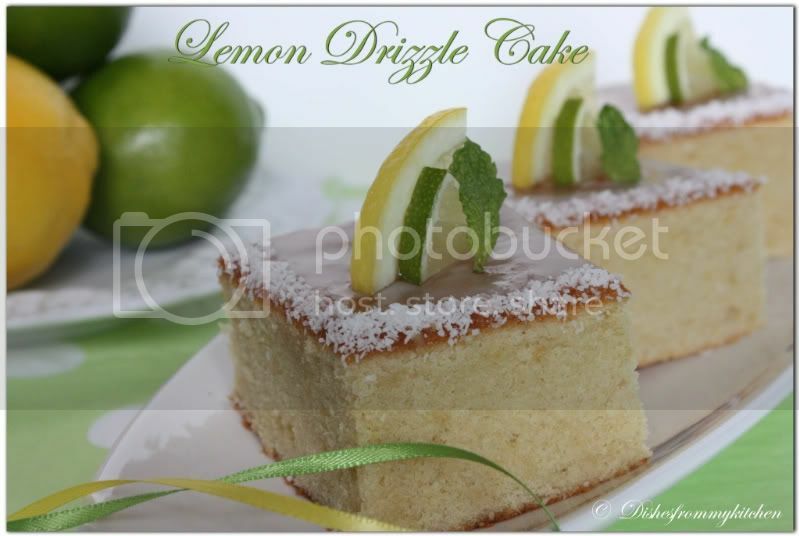 If you are plain cake lover and love the flavors of lemon then go ahead and make this ..I am sure you will like it. 1. Grease the baking pan well with cold butter. 2. Then dust all sides with flour. 3. Remove the extra flour and put the prepared baking pan into the fridge. 4.Sift the flour and baking powder twice. 5. Beat the eggs together with the sugar in a large metal bowl. 7. The temperature helps completely dissolving the sugar and will result in a better consistency. 8. Take away from the heat and keep beating for several minutes. 9. The consistency and color will change. 10. At first, there will be many large bubbles in the mixture that will become less in number and size the more you keep beating. 11. You will also notice that the volume of the mixture increases significantly. So, use a bowl that is large enough, or otherwise. 12. In a separate bowl, whip the soft butter. When the butter turned creamy and light, add the grated lemon zests, then the heavy cream (room temperature). 14. Add the foamy egg mixture to the whipped butter little by little. 16. Fold in the sifted dry ingredients and stir gently. 17. Take the prepared baking pan out from the fridge. 18. Pour the batter into the baking pan and even with a dough scraper or palette knife. 19. Bake for 50-60 minutes in your preheated oven at 350 degree f.
20. After baking, let the cake cool down (in the baking pan). 21. After cooling, invert the cake onto a cake rack. 22. Turn the cake upside down and cut off any “bumps” on the top with a large knife. 23. The browner side will be the bottom of the cake. 1. In a small sauce pan, boil the apricot jam together with the lemon juice and reduce the liquid for a while. Keep stirring to prevent the jam from burning and sticking to the bottom. 2. To test if the apricot jam has the right consistency, drop a little hot jam onto a plate. 3. Let it cool down for a moment. If the jam becomes solid (kind of) and does not stick to your finger, then it’s ready for coating the cake. 4. Use a brush and coat the top and sides of the lemon cake with the hot apricot jam. 6. Using a brush, carefully coat the cake with lemon icing. Welcome back Pavi! And a beautiful post indeed to come back with! Love the pictures as usual. 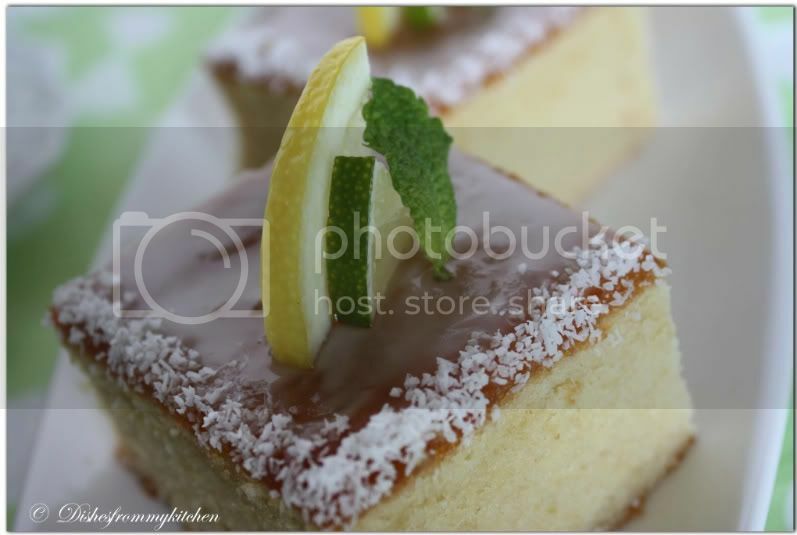 Beautiful clicks....Cake looks super soft and moist...feel like having some now. Great to see you back! Cake looks really spongy and yum!! 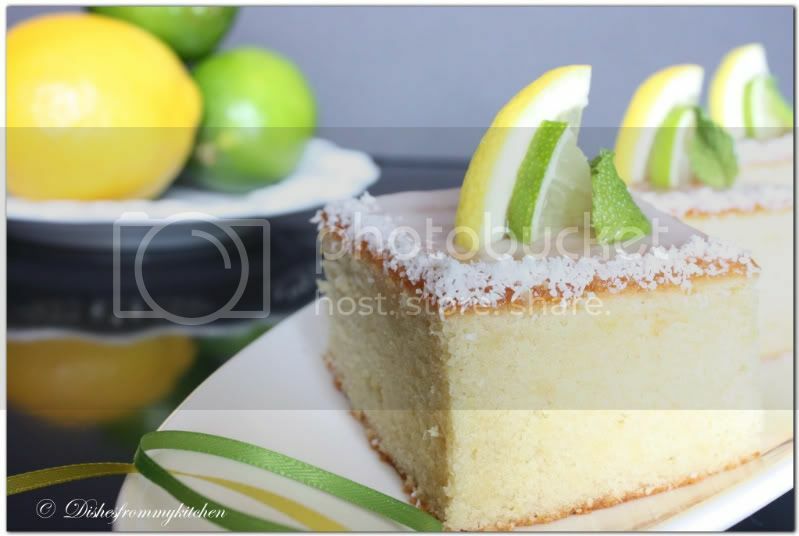 Beautiful presentation..
Wowwwwwwwwwwww.. looks very tempting and delicious.. wonderful presentation dear..
Glad to see u back with this beautiful citrus flavoured cake, looks simply wonderful Pavi..
Gorgeous cake and nice clicks. Lovely clicks.. and i love the cake too..
Feast for the eye! Gorgeous! Lovely cake with some awesome pics. I'm just drooling !!! Welcome back dear ..... I am spellbound seeing the lovely clicks. And the cake looks super moist and cute. lovely cake and yummy clicks! wow, that does look super yummy. What a beautiful presentation. Cake looks so perfect yet the ingredients are so easily available. thanks for sharing this wonderful recipe. Good to see you back! Amazing post,pictures are really nice, the cake shows how perfect you have done it with patience :) Nice presentation too! This looks like such a wonderful, moist and flavorful cake. Welcome back from your break! Lovely click and presentation Pavithra! Yum! the clicks are very nice and I am sure the cake would be too. Wow Pavithra!! Gorgeous, utterly gorgeous cakes here! 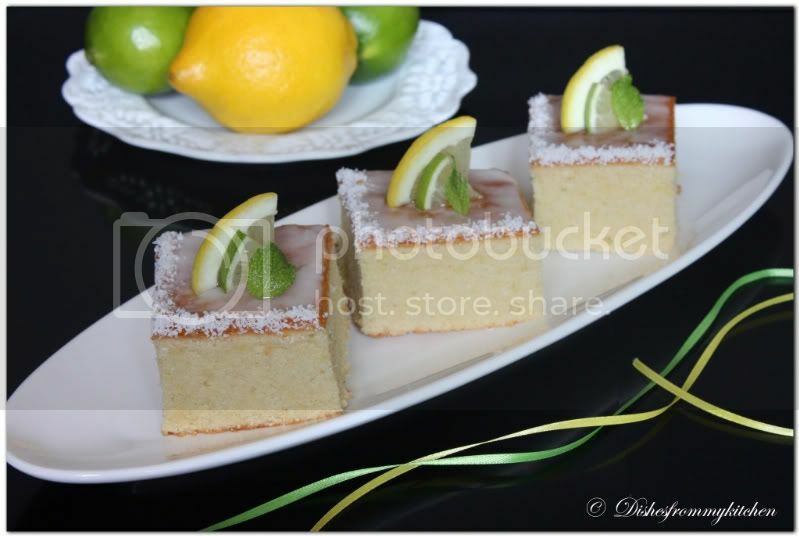 I love zesty cakes, orange is my favorite, should try out lemon too.. Fabulous pics!!! 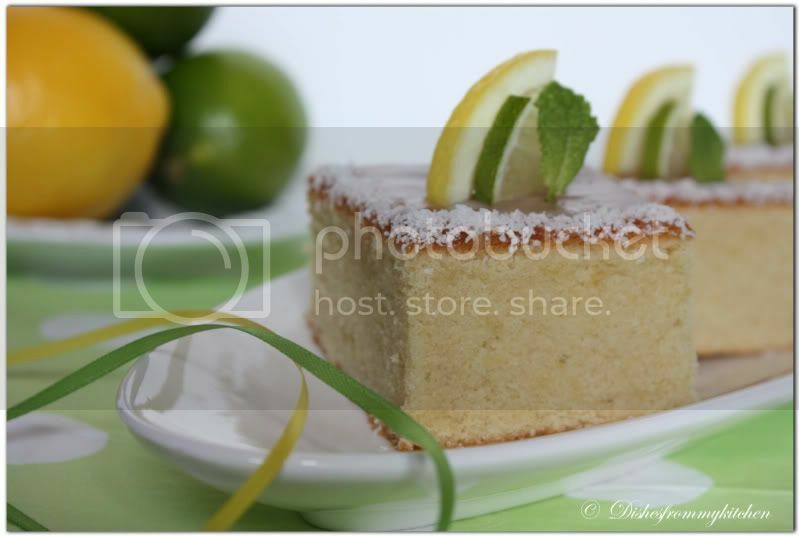 I love lemony cakes and this loks perfect, beatuiful and delcious. Wow so yummy and cute cakes..
Wow! The cake looks so good and beautiful too. The cake looks heavenly and very eye-cathing with that simple yet elegant presentation pavi..just love it. the cake looks so very appealing. delicious. hi pavi..your blog is awesome..your photography is mind blowing..im new to cooking and have this little doubt about self rising flour.where can i find it? Gorgeous! I wish I could just grab them out of the screen! Awesome cakes. I like this lemon flavour for cakes and superb clicks. I love tangy sweet desserts and the texture of these looks amazing. Thanks for sharing this recipe :). This is pure coincedence Pavithra.. I made a Lemon Drizzle cake for my guests last week.. and it was well appreciated.. Thanks for visiting my blog Pavi-have been out of touch from the blogging world for a long time. I hope I can get back to regular blogging now. It looks so perfectly delicious! I love the little strip of white crumbly stuff on the edges...very chic. oh wow, you are killing me with those pics, Pavithra! wonderful decoration and beautifully done. The lemon drizzle cake looks so good. I love citrus flavours in baked goodies. So happy to see u back :) :) The cake looks simply out of the world !!! Your lemon cake looks super yummy.